Researchers can give mice cancer just by leaving lights on at night or not allowing them to get a full night’s sleep. Melatonin helps heal your body and protects from cancer. Not getting enough sleep or sleeping with lights in your room disrupts this process. Take a step toward true health by shutting off all lights in your room and getting a good night’s sleep. What is more important for weight loss, food or fitness? That is a question everyone asks at one point when they are trying to get into better shape. Anytime you do strenuous exercise you use up all the energy in your body by burning a lot of calories. After exercising, the energy is replaced by eating. This is why a lot of people get really hungry or have cravings soon after they workout, especially for sweet or sugary foods such as chips or candy. The reason your body craves these highly processed and sugary foods is because they are absorbed very quickly. I am not a fan of calorie counting (learn why at my Eat More, Exercise Less class), but just for example, you could go to the gym and burn 400 calories doing a workout. If you come home and are starving, you could easily eat 600 calories of processed food. Highly processed foods not only lack nutrients; they actually take nutrients away. So besides eating more calories than you just burned, you are also depleting nutrients from your body, taking two steps backward. 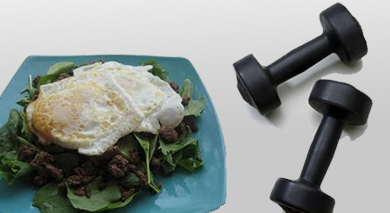 While both are crucial to your success, focus on food first, then fitness. Creating healthy eating habits before starting a workout routine can be the key to success. The next time you workout, make sure you have healthy food for when you get home, so you aren't tempted to eat unhealthy, processed food. Some of my favorite post-workout snacks are whey protein powder with coconut milk or eggs over easy. In my opinion, it is food first, always. Typically when people are trying to get into shape, the first thing they do is get a gym membership and start working out four to five days a week. Making this the first step in your weight loss journey can lead to big problems down the road if you aren’t eating the right type of food first. Donate school supplies and be entered to win a massage! While you are doing back to school shopping please consider picking up a few extra supplies to donate to Saginaw school students. 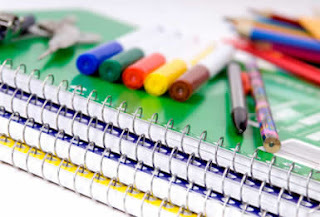 You can drop off school supplies at Kehres Health & Chiropractic located at 4882 Gratiot Road #13 or the Magpie Gallery at 4882 Gratiot Road #13, Saginaw Township, located in Gratiot Place by Crumbs and Beef O Brady's. We will be collecting school supplies until Friday, September 9. Everyone who donates school supplies will be entered to win a free half an hour massage at Kehres Health & Chiropractic! With our garden overflowing with zucchini, we are always looking for new, healthy recipes that use this versatile vegetable. Preheat oven to 350 degrees. In a large soup pot sauté the onions and garlic in the extra-virgin olive oil for about 3 minutes. Add the ground beef and sausage (or turkey as we used), and brown. Season the meat mixture with all of the dry ingredients, add the drained diced tomatoes and tomato paste, and mix well. 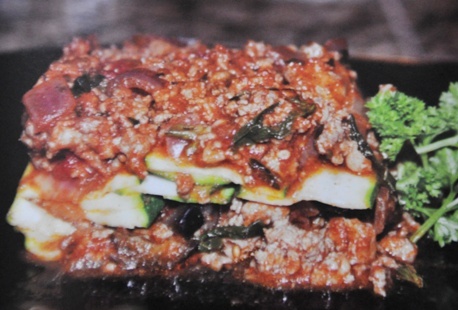 In a 9 x 11 glass baking dish place a layer of sliced zucchini, making sure to overlap the long slices, ladle on a thick layer of the meat mixture, and top with the sliced black olives. Top meat and olive layer with another layer of sliced zucchini, and top with a final layer of the remaining meat mixture. Cover tightly with aluminum foil and bake for 30 minutes. Let the lasagna sit for 10 minutes before slicing and serving. For more recipes from Everyday Paleo, visit everydaypaleo.com. Click here to see Kehres Health recipes. A foam roller is a simple tool that offers a variety of benefits. Almost all of my patients incorporate a foam roller into their warm up exercises in my office, and if you have a foam roller, you can also do this at home. In the video below, Dr. Kehres demonstrates exercises that focus on the piriformis muscle, which is in the gluteal region. When your piriformis muscle is tight, it can cause muscle cramps, gluteal pain, low back pain or pain that radiates down the leg. I highly recommend everyone to get a foam roller so they can do these simple exercises at home, especially athletes and people who sit at a desk all day, as their piriformis muscle is typically very tight. 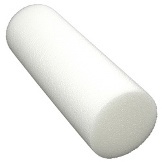 Foam rollers are available at your local sporting goods store or at Kehres Health & Chiropractic for $12.00. All grains contain little proteins called lectins. When lectins reach your stomach your immune system will try to fight them off causing bad inflammation and potentially putting little holes in your stomach lining. Not only does this cause pain and irritation, but now food particles can leak out of your stomach possibly causing allergic reactions to common foods such as chicken or apples. Many autoimmune diseases such as lupus, rheumatoid arthritis or even multiple sclerosis are linked to consumption of lectins found in grains. Eliminate the risk of eating genetically modified foods (GMO), foods produced with chemicals or other fertilizers and grow it yourself! Have you ever noticed that many of the vegetables in your local produce section look identical? That is typically because they are GMO's. Every vegetable grown in an organic non-GMO garden will and should look different. 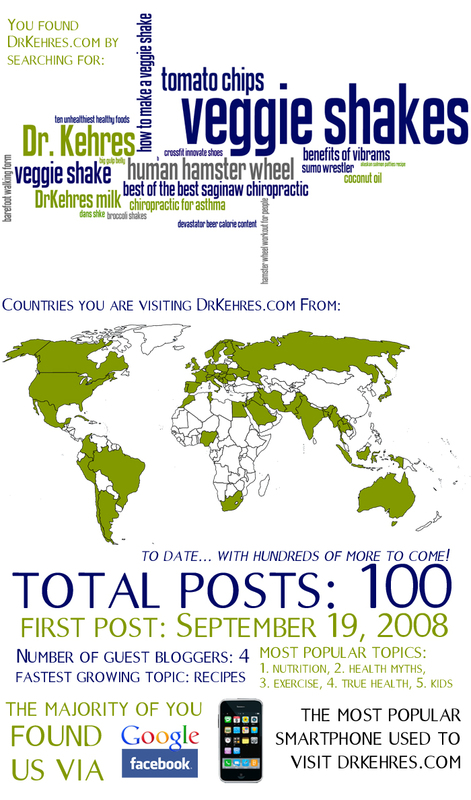 What has been your favorite post? Or what topic do you want us to write about next?